Central Missouri capped off a historic DII women’s basketball season, defeating Ashland for its first national championship since 1984. That’s all in the past, though, as it’s time to get ready for the 2018-19 season. And with every new season comes new rankings. Let’s take a look at the 10 teams that should populate the first 10 spots in the WBCA preseason poll. It’s tough to go against the defending champs. Especially when three of the Jennies’ top scorers are returning to Warrensburg. Paige Redmond led the Jennies in scoring last season, putting up 16.3 points per game. Morgan Fleming (12.3) and Megan Skaggs (11.8) were right behind her, and when you add the return of Sydney Crockett, that gives Central Missouri four of the seven players who appeared in every game last season back on the roster. That’s invaluable experience. Central Missouri will need that experience. Redmond and Crockett are the lone seniors on the roster. That puts this team in prime position for a long run of success led by two veterans that have made it to the top. The toughest obstacle will be replacing Kayonna Lee, who was the muscle for the Jennies in the tournament, which shouldn’t be surprising considering she played football growing up. Lee shined brightest when it mattered most, posting a pair of double-doubles in the postseason run. 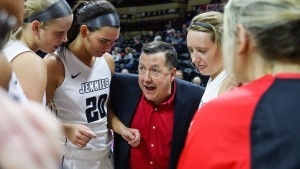 This is a deep Jennies squad, however, and there is little to worry about finding someone to step up into that role. The Eagles are more like a 1B to Central Missouri’s 1A. An end to one of the most dominating eras came at the 2017 DII Women’s Basketball Championship. The Eagles’ 73-game winning streak came to an end, as did the illustrious careers of Andi Daugherty and Laina Snyder, two of the programs only three 2,000-point scorers. And so did the Ashland tenure of head coach Robyn Fralick, who went 104-3 in her three years in Ohio. That is no typo — she went an unthinkable 104-3. Panic not, Eagles fans. There is still plenty in the tank. Kari Pickens takes over at head coach, groomed for this position first as a star player and then as Fralick’s assistant. Jodi Johnson exploded onto the scene and returns as one of the top players (if not the top player) in all of DII women’s basketball. Renee Stimpert, the floor general who ran DII’s most potent offense, also returns. Plenty of underclassmen, like Sara Loomis and Maddie Dackin came into their own last season as budding stars and are now more than ready to step into even larger roles this season. Perhaps the Eagles faithful shouldn’t have expectations of undefeated seasons right off the bat. But there is little reason to believe the Eagles aren’t right back in the hunt come March. The Eagles made it all the way to South Dakota before bowing out in the Elite Eight. The team that went 32-3 in setting a conference record for wins last season has an abundance of returning players that helped get them there. Four of the five starters from last year’s squad are back. That includes leading scorers Mika Webster (17.7 points per game) and Haris Price (17.5 points per game), who also led the team in assists and steals. Breakout star Kayla Marosites returns after posting a double-double on the season (12.1 points, 10.4 assists) as does her sister Kelci who led all reserves in scoring with 6.8 points a game. All-American in 2018: 2@Mika_Wester and @HarisJordan lauded by the @wbca1981 for their efforts as juniors. With the amount of returning firepower, the Eagles will make a case to be the No. 1 team every week this season. They are certainly challenging themselves early with three 2017 tournament teams — North Georgia, Lander, and Columbus State — on their out-of-conference schedule, so we’ll see just how good the Eagles are pretty quickly. Drury has been a perennial contender since head coach Molly Miller took over in 2014. The Panthers have gone 113-16 over that span. There’s just been one problem: Ashland is in Drury’s region. The two have gone at it in the tournament quite a bit. In 2015, Drury ended the Eagles’ season in the Midwest semifinals in dominating fashion, winning 86-60. The following season saw Ashland return the favor in the Midwest Region championship, ousting Drury 74-62. Last season’s rematch was a close one, but Ashland prevailed once again, winning 79-73 to advance to the Elite Eight. If there’s a George Foreman-Muhammed Ali rivalry in the Midwest Region, you’re looking at it. While there’s a changing of the guard in Ashland, Drury has a lot more stability. Miller returns to the Panthers along with more than a handful of her trusted players. Hailey Diestelkamp is one of the toughest players in the Great Lakes Valley Conference and can score and board with anybody. She joins Daejah Bernard and Lucia Fernandez back in the Panthers starting rotation, all three of which started every game last season. Three key reserves from last season — Payton Richards, Azia Lynch and Emily Parker — are also back. All three averaged more than 10 minutes per game so shouldn’t have any issue taking on an expanded role. There’s never been a better time for Drury to capture that elusive Midwest Region championship. Megan Smith is gone, and that hurts as the senior had a huge 2017-18 season and was a dominating force in the Elite Eight. But head coach Tom McConnell will have a lot of familiar faces this season to work with on getting back to the tournament. Carolyn Appleby is back and so are her 15.4 points per game, second-best to Smith last season. Lauren Wolosik also returns, who led the Crimson Hawks in both assists and steals last year. Add in Brittany Robinson and you have three starters who played every game on IUP’s run to the national semifinals last season. That certainly helps in a quest to return to the Elite Eight. Losing All-American Tess Bruffey is going to hurt, but that said, six of the eight players that played large roles in the Lady Chaps Elite Eight run return this season. If coach Steve Gomez has shown anything during LCU’s DII era it’s that he’s a winner. Four of the top five leading scorers return to Canyon, Texas. That includes leading scorer Lexy Hightower, who seems on the verge of stardom. The Lady Buffs lost a heartbreaker to Lubbock Christion in the regional finals, missing out on the Elite Eight by four points. You can be sure that will fuel their fire in getting back to the tournament this season. Jontay Walton, Ciara Rosten, Michaela Barnes, and Michelle Jahn combined to score 1,843 of the Fighting Scots 2,461 points last season. All four return looking to build on last season’s 27-win season. New head coach Callie Wheeler steps into the perfect situation and Edinboro shouldn’t miss a beat under her guidance. The Seawolves have averaged 31 wins a season the past four years, so it’s not hard to see why they are deserving of a top 10 spot. They lost some firepower, but leading scorer and rebounder Hannah Wandersee (14.8 points, 6.3 rebounds per game) and assists-leader Yazmeen Goo are back to guide this team to what should be yet another successful run. The Panthers lost their star player Alexis Johnson to graduation, but that’s what they are used to at Virginia Union. The Panthers have seemingly lost a frontline player each season from Kiana Johnson to Lady Walker and now Johnson. But head coach AnnMarie Gilbert keeps winning. Wonder twins Shameka McNeill and Shareka McNeill had strong freshmen campaigns and should be even better as they form into the leaders of this Panthers squad. This was the toughest spot to pick. Bentley, Glenville State, Stonehill and Augustana (S.D.) all deserved serious consideration. The problem these five teams share is the loss of big players, and U Sciences have just a bit more returning firepower to give it the early season edge. Alex Thomas and Jordan Vitelli return after combing for 25.7 points per game in the Devils’ 30-win season.